window, looking down at a street festooned with flags. I thought I could make something out of the London scene. When I returned to New Zealand, I did a couple of small paintings that came out well, but I felt I could improve on these if I scaled it up and built up more on the theme of flags. Eventually I worked up the scene so much that only the buildings remained true to the view I had seen. 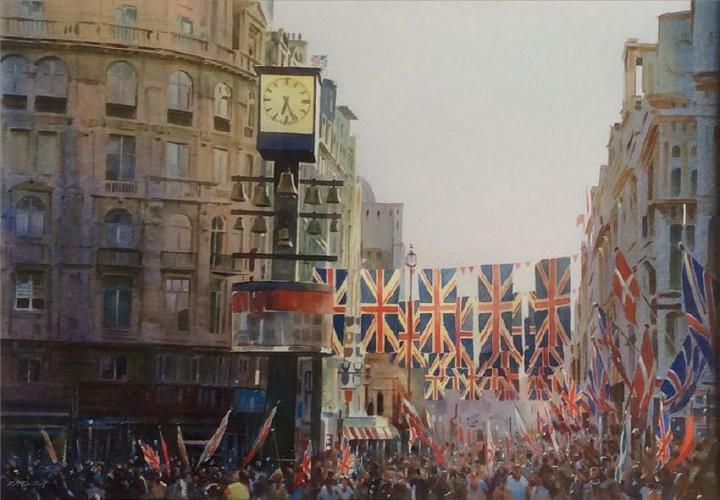 There was a lot of detail with the flags and the buildings, and it was a challenge to avoid the painting becoming overworked, something that has ruined many a good watercolour. So I treated the background and the mforeground with the crowds of people much more loosely with just touches of detail to avoid this pitfall. 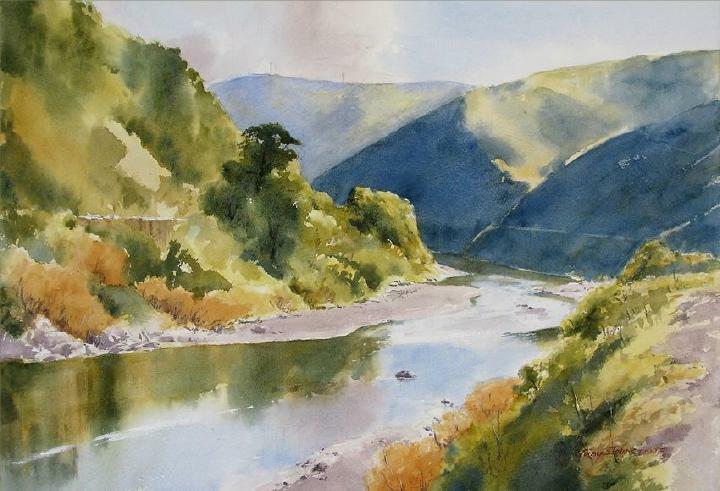 Judy: have been on the Railway Walk through the Manawatu Gorge a number of times. The Woodville Lions Club ran the walk as a fundraiser each year and the track was closed to trains for several hours. Walkers numbered about 600 and came from far and wide. We were bused to the Woodville end of the gorge and walk on the track back to the Ashhurst domain. The walk has been cancelled since the slips. I found it easier to take photographs as I could gather as much inspiration as possible. My subject is seen from the rail side looking to the first corner in from the arched bridge at the Woodville end. I made a couple of preliminary drawings before transferring the image to my watercolour paper and worked on the subject over a couple of weeks. The geography of the gorge is quite challenging to paint and the sunlight on the morning walk made all the difference. Now we can no longer enter the area. Marianne: My model Leonard is a beautiful dark striped tabby with a big personality and white tummy and paws. He often sleeps on the top of the couch in this position to have a high vantage point, safely away from the dog. 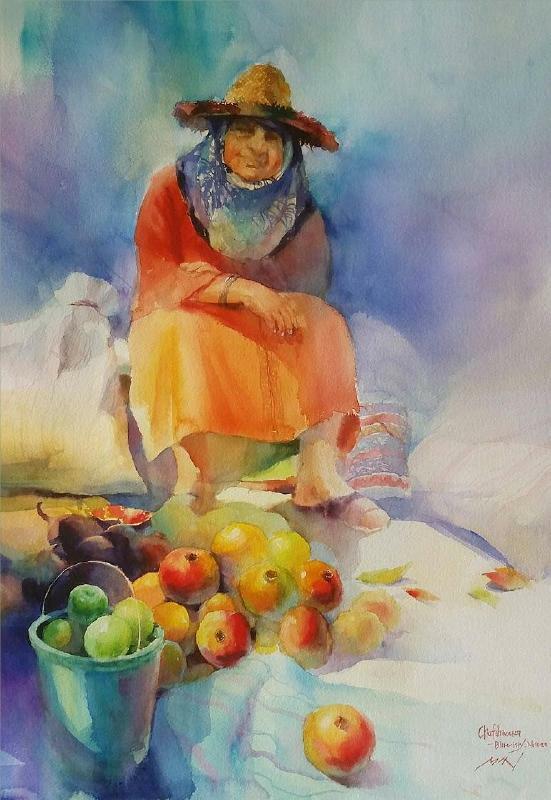 I used Arches 300gsm rough paper and Daniel Smith watercolours. I don’t often use black, but in this painting I used Lunar Black. It is a neutral black which creates interesting texture which I thought would look like fur. 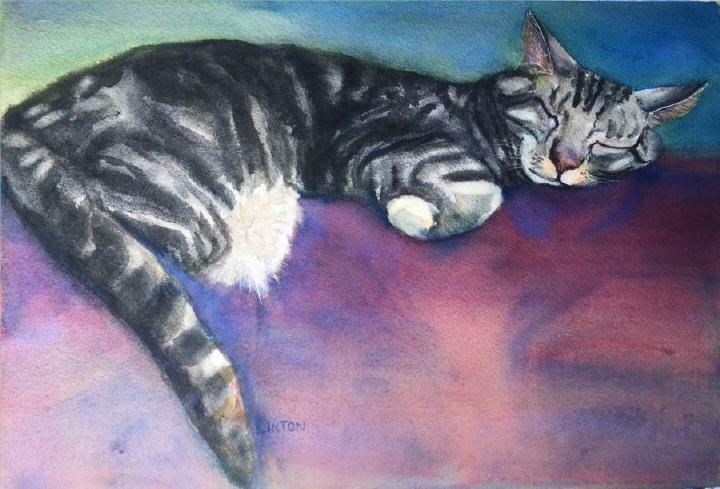 I wet both sides of the paper to make sure that I would have plenty of time to paint the fuzzy black tabby fur stripes. Most of the background was painted on an almost vertical angle to look like a vertical side of a couch, with layers of Aureolin then Quinacridone Pink for the couch mixing it all together wet-in-wet on the paper. A final wash of Cobalt Blue helped to pull it together and knocked back the bright colour. I mostly used large brushes but got a small brush out and gouache for his whiskers and hairy ears. I love painting animals so my next challenges are our other tabby cat and Dougal the labradoodle. 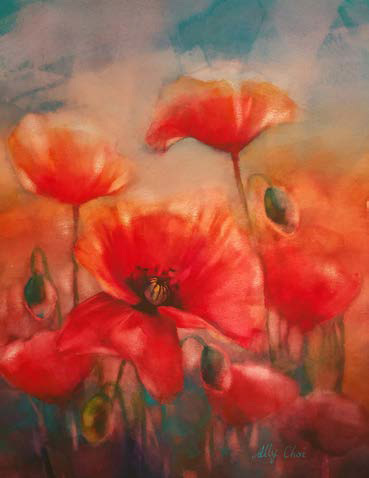 Ally: I have always been attracted to poppies with their gorgeous form, vivid colours and very thin petals swaying in a light breeze and had dreamed to paint my own style of poppies one day so it was natural for me to paint poppies for the Splash exhibition this year. After I decided on the subject, I drew three large pencil drawings to study the poppies’ characteristics. Then, in watercolour I practised the colour tone of poppies from yellow, orange, opera, red, crimson lake to violet and painted poppies in different shapes and poses. 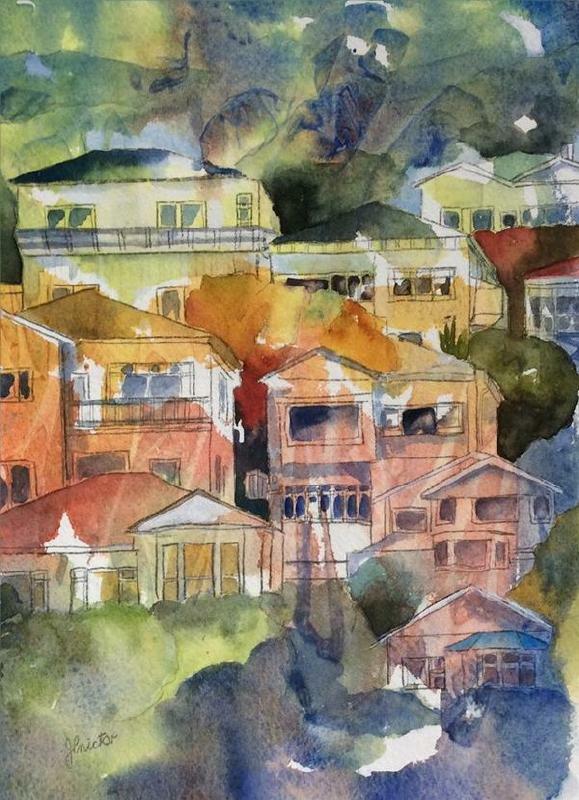 Judy: For some time I had been longing to paint houses perched on Wellington’s hillsides. I loved the way they nestled into the trees and bush, and the way the shadows and light made them look very “comfortable”. I was unsure where or how to start and looking at the blank sheet of beautiful Arches 600gsm paper didn’t make it easier. using the three primary colours, yellow, red and blue. I did this by mixing the colours individually on little dishes and randomly pouring them on to the paper. I placed pieces of scrunched up glad wrap on areas to create some texture. PATIENTLY leaving it to dry overnight, emotion and excitement arose when on removing the glad wrap there were my houses! After the drawing, most of the painting was in the negative areas and the only other colours used were a gold and burnt sienna.